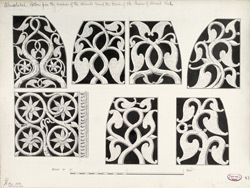 Illustration of the patterns from the windows of the colonade round the tombs of the queens of Ahmad Shah in Ahmadabad from James Burgess' 'Original Drawings [of] Muhammadan Architecture of Ahmadabad.' In the centre of Sultan Ahmad Shah (r.1411-42) city of Ahmadabad, next to the Ahmad Shah tomb, is another tomb complex called the Rani-Ka-Hujra or Tombs of the Queens of Ahmad Shah built c.1440. This arcaded and screened enclosure contains eight marble tombs, including the tomb of Bibi Mughali, the wife of Muhammad Shah II and mother of Sultan Mahmud Begada (r.1459-1511).